Over the weekend, NeueHouse hosted the 2014 Creative Time Fall Ball, featuring art installations and performances by Tom Sachs, Marco Brambilla, Vanity Projects, Robert Pruitt and Will Cotton, as well as musical sets by a variety of talented DJ's and musical performances featuring Sasha Frere Jones and Citizens Band. The eccentric, wild sleepover featured a lazered-out dance party and had Dustin Yellin running around practically naked (see slideshow). 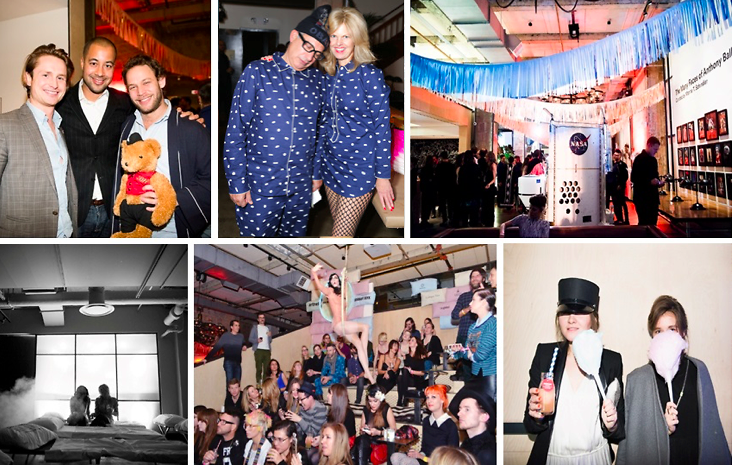 Other guests sported their best pajama ensembles (Jon Neidich even brought along a teddy!) to the overnight extravaganza. Guests enjoyed slushie cocktails, cotton candy, and all the best sleepover games: Twister, puzzles, yoga, and more, before heading to bed where an array of perfectly-lined cots were set up for tired party goers. For an inside look at the event, be absolutely sure to check out our slideshow. Who was there: Guests included Waris Ahluwalia, Ben Bronfman, Dustin Yellin, Maria Brito, Cecilia Dean, Tom Sachs, Kyle DeWoody, Timo Weiland, Selby Drummond, Alexandra Chemla, Arden Wohl, Jonas Tåhlin, Madeline Weeks, Maxwell Osbourne, Jake Hoffman, Sabine Heller, Ruth Graca, Mike Starn, Hayden Dunham, Halley Wollens, Manchildblack, Satu Greenberg, Jesse Hudnutt, Nir Hod, Duke Riley, Naomi Shimada, Aaron David Ross, Ryder Ripps, Ai Kato, Xavier Cha, José Parlá, Kehinde Wiley, Sebastian Errazuriz, Andrea Mary Marshall, Caroline Polachek, Jen Catron, and Paul Outlaw and more.